As I continue through the second part of the series, I move on to actual songs. These are originals, and you can find live performance videos of them both here and on my You Tube site, on the performance video playlist. Here I play the actual rhythm part I use for the song , a real world example of the what I do with the dulcimer, a clear rendition of what the dulcimer is doing behind the vocals in those performances. I used two songs with very different beats, as well, and combined them in one video to let you compare both differences and things in common. 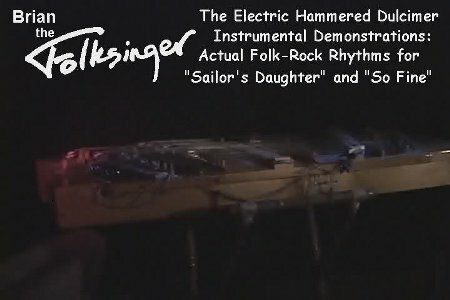 This entry was posted on Wednesday, April 28th, 2010 at 5:10 am	and is filed under The Electric Hammered Dulcimer. You can follow any responses to this entry through the RSS 2.0 feed. Both comments and pings are currently closed.